I was a little bothered about the standard of orchestral playing that I was about to experience on this recording: unless my memory is failing me, I had not previously encountered the Málaga Philharmonic. I need not have concerned myself – they play excellently under guest conductor Paul Mann, and the top-flight recording copes well with the extremes of dynamic encountered in the Symphony No. 4. The booklet contains a short musical autobiography of the composer, and a description of each work, movement by movement. 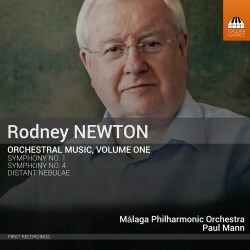 Rodney Newton studied at the Royal Birmingham Conservatoire, and then worked as an orchestral percussionist with various orchestras, including 11 years with the English National Opera. In 1985 he decided to leave the company to follow a career as a composer, orchestrator and musical director in films and television. In the 1990s he expanded his activities into the realm of brass and military bands. He has since composed for, conducted and adjudicated in brass band contests at home and abroad. Between 1967 and 1979 he composed a large number of orchestral works, including eight symphonies and a ballet score. However, very few were ever played, and the performances of the two symphonies on this CD are not only first recordings, but first performances. Newton himself remarks that the first symphony shows the influence of Shostakovitch and Vaughan Williams, and I concur. Many times did I feel the presence of RVW, and not only in the fine slow movement, in which pastoral episodes are contrasted with more dramatic gestures, but also the finale, where RVW in ‘galumphing, biting and jaunty dance mode’ makes his presence felt. I have played this symphony many times and have enjoyed it more and more with each playing. The recording splendidly catches the percussion-led sections in the first movement. Six years separate the fourth symphony from the first. Newton’s style changed markedly, becoming more chromatic and tonally ambiguous. He says that this change led to him adopting serial techniques in later symphonies. The first movement is entitled Metamorphoses. As the name suggests, an introductory theme is subjected to metamorphosis. I found this to be the most difficult movement to enjoy, perhaps because of its drifts towards serialism (I am not a fan!). The second movement, an elegy, is sombre and powerful. The mood is heightened by a tolling bell and funereal drum leading to a warm, powerful climax accompanied by pealing bells. This is followed by a malevolent scherzo, which is quite scary at times, and culminates in a violent solo for a kit drummer. The composer writes that, as he was composing, he could hear the sound of dance bands in a nearby hall, and decided to make this movement sound like ‘a dance hall in hell’. This movement makes a continuous transition into the last, Passacaglia, Variations and Epilogue, in which a solo trombone opens, answered by a solo trumpet. The material undergoes several transformations, leading to a very powerful climax followed by a quiet section that leads into the epilogue. There is no doubt that this symphony demands more of the listener. The RVW influences are well buried, but I do feel that it is successful in plotting a course that leads to the climaxes and epilogue of the finale, more so than the first symphony, whose movements seem to me to be more disjoint. I like the final work on the CD the most: a short tone-poem, a meditation on the starry night sky. It begins with textures that are string-saturated, becoming more diverse in its scoring as the work continues. Repeated listening has firmly established it in my mind as a piece that emphatically does not deserve neglect, far from it. It is not just a meditative flow. Indeed, at the centre the ensemble fragments for a few seconds; it is perhaps (my idea) an illustration of the chaos that we now know subtends at the centre of galaxies, and during the birth and death of stars. Well, galactic or not, this is a splendid CD that deserves to succeed on many fronts.